I’m flying over a small island. Glancing out of the side of the cockpit, I can see the small amount of “civilisation” on this otherwise untamed little piece of land; the rest is dominated by a large hill, covered with trees. As I pass over the summit of the hill, my craft comes out from beneath the cloud cover. Sunlight suddenly streams in from behind me, bathing my instruments and multifunction displays in bright light, punctuated by the dark, intense shadows my cockpit struts cast. I haven’t quite finished Ace Combat 7’s campaign as yet, but I thought I’d give the VR mode a try, since I happen to have an under-utilised PSVR handy and the experience is designed to be completely separate from the “main” game. I was hoping to jump right into the Free Flight mode; a stressful few days made me think that just being able to mess around in my very own jet fighter would be pleasantly relaxing, but I discovered you can’t play Free Flight mode until you’ve completed at least one of the three available missions, at which point you unlock that map for freeform funtimes. Oh well, into the missions we go, I guess. 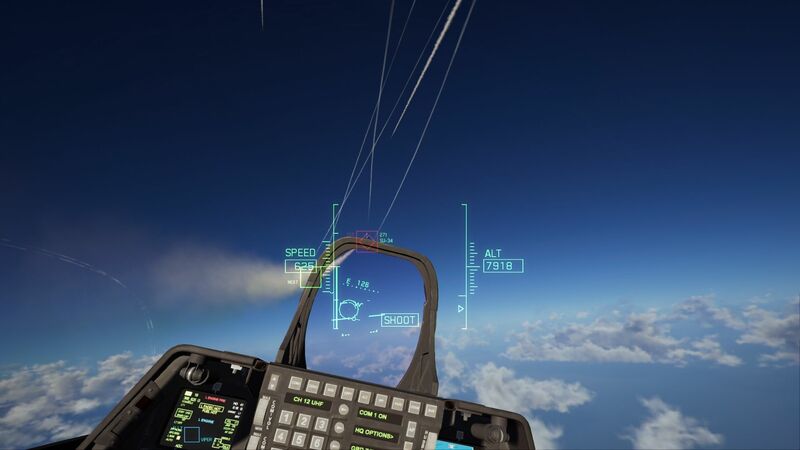 In VR mode, you take on the role of Ace Combat 4’s hero, Mobius 1, who has apparently been brought out of retirement to deal with a conflict that has suddenly sprung up. 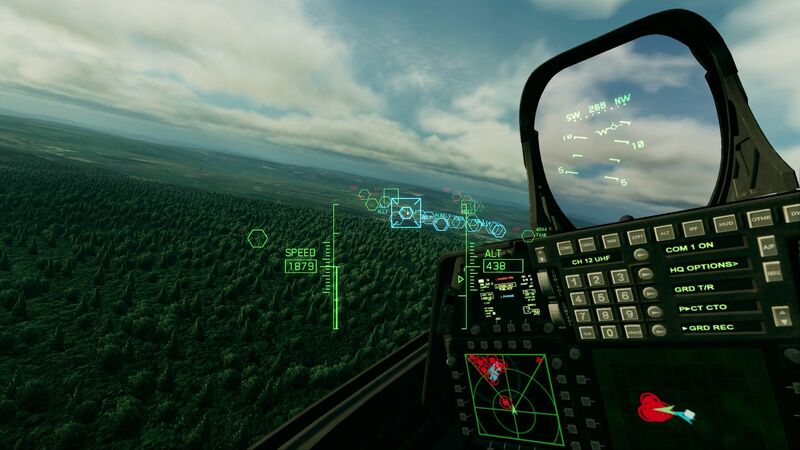 The three missions involve high-altitude air-to-air combat, seek and destroy and base defense, and more air-to-air combat against ace pilots over a gorgeous mountain range. The missions themselves are challenging and enjoyable, and exactly the sort of experience you get from the main game. There’s voiced dialogue, there are surprise changes in mission objectives partway through, there’s dramatic music, and there’s planes that can carry sixty or seventy missiles without breaking a sweat. There are a few differences from the norm, however, most notably in terms of interface. 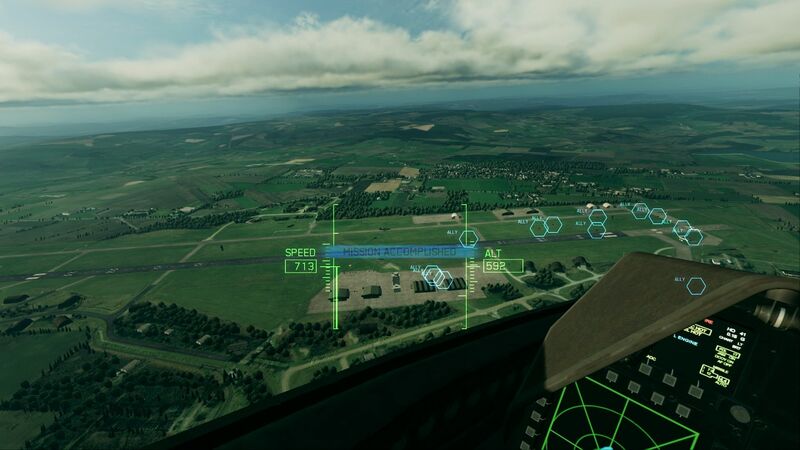 The head up display’s pitch ladder and compass are now actually projected onto the head up display in the cockpit, while the speed, altitude and targeting readouts are projected into your “visor”, meaning you can always see them even when not looking straight forwards. 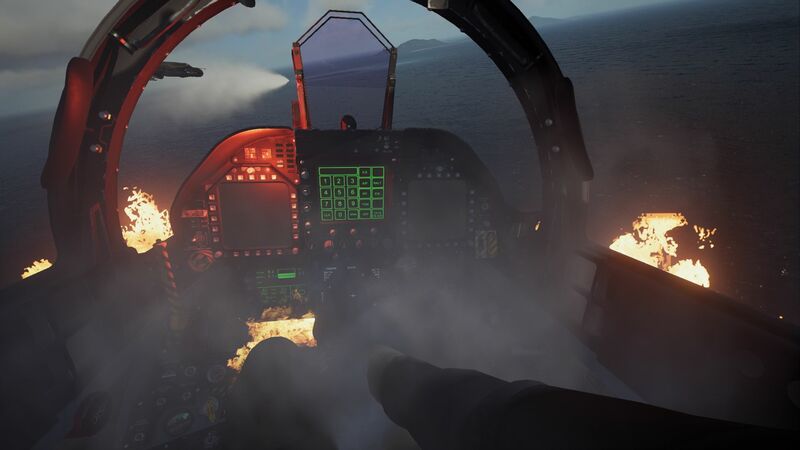 Rather than “floating” in front of the cockpit as in the main game modes, the radar and map display is now integrated into the cockpit itself, meaning you’ll actually have to glance down at it to see where you are, where your targets are and where you should be going — likewise for your aircraft’s status display, indicating your remaining weaponry and damage level. 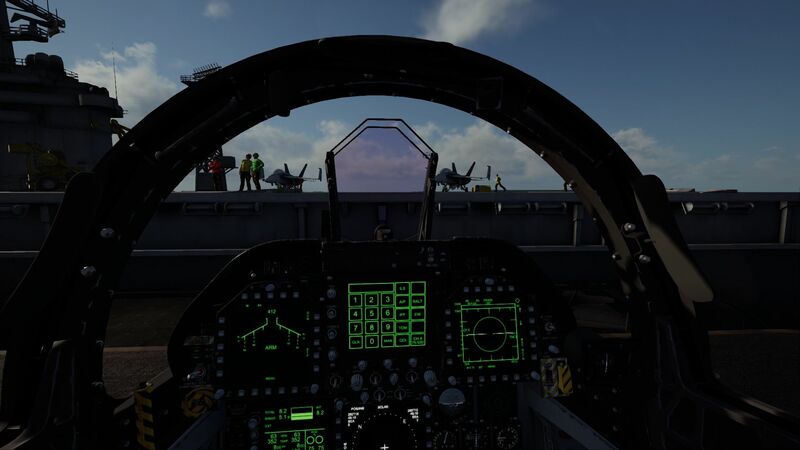 On top of these minor tweaks, the analogue instruments in the cockpit all work as well, and with the motion tracking afforded by the PSVR’s use of the camera, you can even lean right in and look at them up close if you want to. There’s not a lot of time to do that in the heat of a dogfight or search-and-destroy session, however, so it’s best saved for Free Flight. 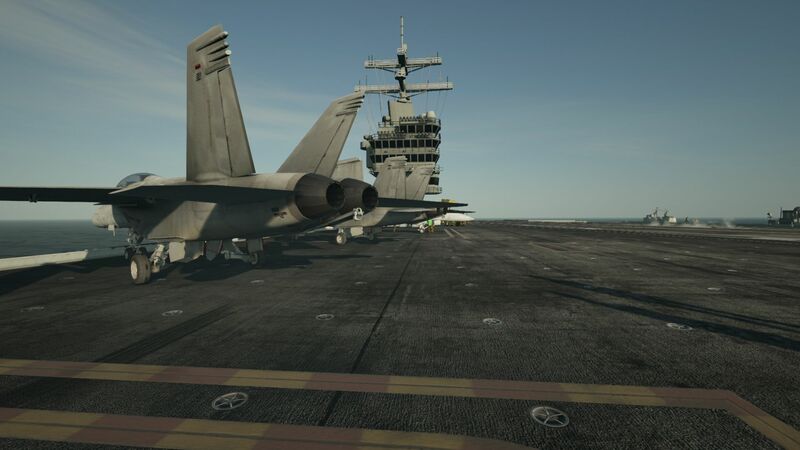 The first mission begins with a carrier launch, which you see from within the cockpit right from your F-18 being brought up to the main deck on an elevator. The second begins with a perilous runway launch during an attack on your airbase, with explosions happening all around you and allied planes crashing to the ground inches from where you’ll be taking off from. Both of these are very exciting for different reasons! Up in the sky, all the controls work as they do in the standard 2D mode — although you can only use the “Expert” control scheme (which responds like a real plane, with pitch, roll and yaw all controlled separately rather than “push left to turn left”). There’s no “projection” of the DualShock into the cockpit, however, so I hope you’re familiar with the button placements; instead, you can see “your” hands manipulating the aircraft’s joystick and throttle control in response to your inputs. “Your” legs even move to use the pedals when using the rudder controls — an oft-forgotten detail in flight sims. The handling, of course, is not terribly realistic — but this is Ace Combat, after all, so if you were expecting realistic handling, I have some unfortunate news for you. However, what this means is that you can really fling your craft around the sky without having to worry about pesky G-force or anything stupid and dumb like that, so go to town on death defying manoeuvres, because your enemies certainly will, particularly in the final mission! I was expecting all the pitching and rolling to be vomit-inducing, but I actually found it to not be too taxing, particularly when at high altitude. The second mission, which unfolds at low altitude due to its focus on ground targets, is much harder work since you’re closer to the ground and the sense of speed is frighteningly convincing when you’re this low; there’s lots of detail on the ground, right down to individually modelled trees, so you really feel it. 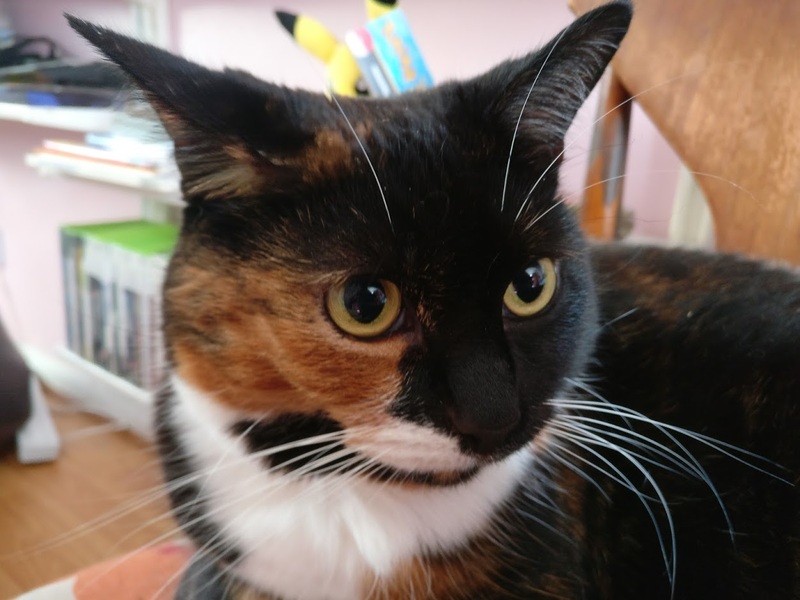 This one left me a bit dizzy and dazed after it was all over, but not nauseated by any means. Instead, I found the whole experience to be surprisingly convincing; I found looking out of the side of the canopy while making a relatively shallow turn to feel remarkably like looking out of the window of a real passenger plane when it’s turning — you can tell you’re a long way up and that you’re moving, and it’s a little bit unsettling, but you also know you’re probably going to be all right. Damage to your craft is handled nicely, with some satisfyingly weighty “judder” effects on the cockpit (and booming sound effects — wear headphones!) when you get hit, and upsetting warning lights starting to flash when you’re at critical damage levels. Actually being destroyed is only mildly traumatic, consisting of your aircraft controls stopping responding, your displays flickering and fires breaking out in the cockpit before an explosion engulfs your vision; after a few mission failures it, to be honest, becomes slightly irritating more than anything, since you don’t appear to be able to skip it and just retry right away. It might also have been nice to see a bit more variety rather than the same animation every time — maybe sometimes your canopy could have shattered, or there could have been a stomach-churning eject sequence. Still, I guess it encourages you to stop pratting about and get good — you are Mobius frigging 1, after all. Once you’ve played through all three missions — which are all replayable for better scores and grades should you so desire — you unlock the map on which the mission was based for Free Flight mode, at which point you can pootle about it at your leisure in either the F-18 you do your first playthrough of the VR mini-campaign in, or, once you unlock them, one of three other aircraft. It’s a pity you don’t get to do the takeoff and landing sequences in Free Flight, however; you simply start in the air. But, as I described in the introduction, that’s plenty of opportunity to have some fun, and I see myself returning to this experience as a means of relaxing and chilling out more than the rather intense missions! Ace Combat 7’s VR mode has provided me with the VR experience I’ve wanted ever since I first knew VR was a thing. It’s let me sit in the cockpit of something I’d never be able to even get close to in reality, then take it up in the sky and fling it around a bit while pretending to be the world’s best pilot. 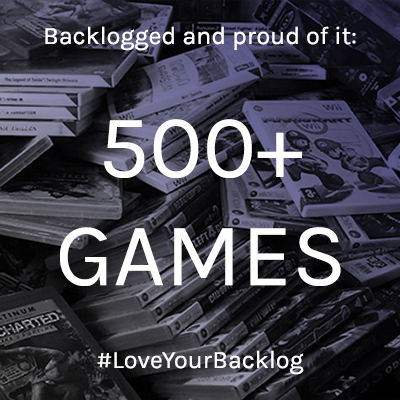 While a little limited in overall content, the whole experience has brought me great joy — and the possibility of it being expanded over time isn’t out of the question, either. 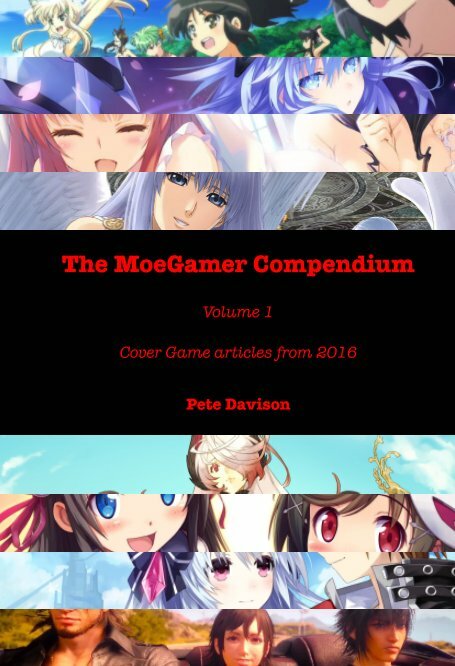 I’m really happy this content was included in the game package, and that I’ve had the opportunity to enjoy it. If you have the means of doing so, I strongly recommend giving it a shot for yourself!